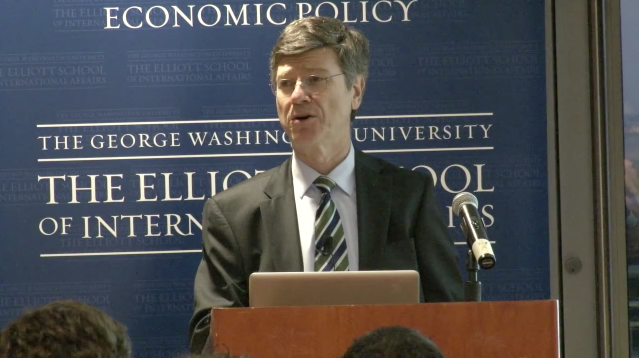 Last month Professor Jeffrey Sachs, renowned economist and Director of the Earth Institute at Columbia University, stopped by GW's Elliott School of International Affairs to discuss the future research agenda for sustainable development. Sachs spoke extensively about what exactly sustainable development means, and how "dangerously off-course" he considers the world to be. His core theme: that there are no easy answers to be had, and hard decisions lie ahead. Sachs closed by presenting twelve "Grand Challenges" for a sustainable future, the twelve issues he sees as absolutely essential to moving this planet forward. Explore the interactive video below to hear what Sachs thinks the big challenges ahead are.